Informal Gathering: Service at Vintage Faith in Santa Cruz. This is what it looks like when cool people go to church. South Bay converts are flocking to a Santa Cruz church that's muscling in on the Christian evangelical movement by accepting MTV, flip-flops and intellectual curiosity into their hearts. Is it just attitude, or is this hip movement really a new kind of Christianity? THEY DRIVE over the hill in pursuit of God. Cheryl Isaacson comes from Willow Glen every weekend, Shannon Marie from west side San Jose. Isaacson, a middle-aged graphic designer, was always a Christian, but couldn't find spiritual fulfillment in one of the South Bay's big box churches. Marie, a 21-year-old student photographer, wasn't brought up in a religious household. Her grandmother was a Jehovah's Witness; her father was disinterested in religion. She dated a Muslim for a while and grew interested in Islam—but when the relationship went south, so did her interest. Then she found herself accepting Jesus Christ as her personal savior at a new church in Santa Cruz. It's called Vintage Faith Church, and it's part of what's become known as an "emerging" church movement in evangelical circles. The "vintage" refers to a reach back into Christianity's earliest traditions, and a fast-growing body of converts is responding. In this era of the Religious Right and the Spiritual Left, Vintage Faith is at the forefront of an intriguing trend in America's evangelical landscape: it is a church with deeply conservative roots that nevertheless preaches a theme of introspection and constant self-examination so often missing in the finger-pointing sermons of modern evangelicalism. Here, the unbelieving world isn't the devil; the battleground is within. 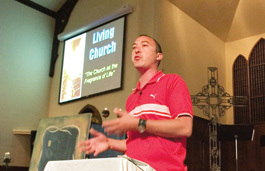 "What you'll find in the emerging church is people who had a crisis of faith," says Isaacson. "People woke up, and said, 'What am I doing? I've been Christian my whole life and feel like I'm a machine, following something that's man-made.' For some people, it becomes a de-conversion; for people like me, it becomes like a stripping. You have to take your faith and make it raw. You have to ask what is it in our religion that is part of this culture, and what is it that is part of this ancient religion that I'm passionate about." Church is in session, and the pastor is outfitted in a snazzy red Puma tennis shirt. The church band is a bluegrass-influenced quartet featuring a tall standup bassist and backup guitarist sporting a low-cut, black Mohawk. The chatty, ebullient church staffer making the announcements has come to the 7pm evening service after spending a day at the beach, attired in jeans rolled up four inches at the hems and flip-flops. The congregation—about 250 mostly young worshippers, some of whom drape their bare feet nonchalantly over the pew in front of them—look much the same. Low-cut jeans, tank tops and tattoos far outnumber traditional Sunday-bests. It is Santa Cruz and it would be easy enough to write the scene off as a direct consequence of just that. But American evangelicals—and make no bones about it, this is an evangelical church—have long been known to play loose with the formats governing worship in order to attract believers, which is why Pastor Rick Warren, the leader of Orange County's Saddleback Church, which along with Willow Creek in Chicago is one of America's most influential megachurches, can wear colorful Hawaiian shirts at the pulpit without any qualms about violating sacred space. And, only three weeks ago, Richard Mouw, president of Fuller Theological Seminary in Pasadena, the largest evangelical seminary in the United States, underlined, in an address to an ecumenical gathering in downtown San Jose's Fairmont Hotel, the idea that American evangelicals have been historically flexible. "Our infrastructure fits the postmodern structure a lot better [than other churches]," said Mouw, in town to deliver a keynote for the National Workshop on Christian Unity. "We've been the great deconstructionists of the last 30 years [regarding] the structure, or patterns, of church. Would you call this a worship service? Would you call this a hymn? We must be all things to all human beings." It's a movement—or conversation, as its leaders like to call it—that's known as post-evangelical, or post-conservative, or Emergent Christianity. And, it could perhaps be described as a version of evangelicalism that still holds fast to many of the emotional absolutes of the faith—that Jesus did die for humanity's sins, that he was resurrected, that miracles were part of Christ's life—and to the tenants of evangelicalism—including its emphasis on the personal experience of Jesus and its regard of the Bible as the supreme authority, as well as its mission-centric focus. But in addition to these conservative characteristics, it is also sprinkled with a healthy dose of a Jim Wallis-type of social consciousness, where moral issues may very well include questions about sexual orientation but are also extended to questions about economic injustice and war and the collective—as opposed to the personal—good, and a healthy curiosity about Christianity's rich liturgical past. Ritualistic foot-washing, or emulating Jesus washing the feet of his disciples at the Last Supper, is making a comeback, even in Protestant denominations, as is the ancient Christian ritual of the "holy" kiss. Saints, pushed out for so long by Reformists, are now more intriguing. "I think," Brian McLaren, a pastor and a leading writer in the Emergent conversation, told Christian Today in 2004, "the real story is both evangelicals and the mainline learning from the Catholics." And, if traditional evangelicals look toward the global south, in Africa or South America, as their mission fields, these new evangelicals see the mission fields being right here in the United States, in places like Santa Cruz, where one local pastor asserts that about 90 percent of the population has no relationship with a church. Back at Vintage Faith, the pastor in the Puma shirt, Robert Namba, begins his sermon. He stands below the stage, at a level that's more intimate with his congregation. The lights are dimmed and a large painting that depicts a tree with a scroll wrapped around it dominates the background—"It softens up the room," says a member of the church's Sacred Space team, which is responsible for creating the atmosphere of the sanctuary. Two smaller paintings are in the foreground; one of them was painted during the previous week's service. The sermon is about a theme that repeats itself in the Bible, that of an "aroma pleasing to God." Namba passes around a bag of fresh Kona coffee for his congregation to smell and goes through a number of verses which feature a version of that phrase. Then, near the end of his sermon, he asks his congregation, "What is our aroma? What is our smell?" Namba answers his own question by reminding his congregation about some of the answers volunteers from Vintage Faith received when they surveyed unbelievers locally about their thoughts about Christians. "They should all be shot," was one of the answers; Namba's audience laughs. "I saw a bumper sticker once; it read, 'Jesus, save me from your followers.' The aroma is not good, folks," Namba concludes. "The thing that called me to Jesus is to see people who represent Jesus. Are you flexible when things don't go your way? Are you someone who [has] regard for the stranger and the outcast? Do you seek the needs of others before your own?" House of Worship Meets House of Style: Pastor Dan Kimball leads a service at Vintage Faith. Why is this newest trend in churches so popular? According to Robert Webber, who has written a number of books centered on the theme of reaching back to ancient Christian spiritual practices and is regarded as one of the leading thinkers taking part in the Emergent conversation, the rise of the Emergent church represents a third wave of deconstructionist reform in America's evangelical history. First, says Webber, the fundamentalist evangelicalism that had been prevalent in pre-1950s America gave way to Billy Graham-type neoevangelicals, which then led to the megachurches of the "church-growth" phenomenon in the 1980s, and now to the Emergent church. "There's a sense where evangelicals are culture chasers," says Webber. "As cultures begin to change, evangelicals begin to change with that culture. The megachurch became rooted in a sort of broadcast, communication, television [culture] and began to create show-type churches. I hope the megachurches will catch on to some of the aspects of this movement. There's no reason why they can't pick up on it." Vintage Faith, in many ways, is perched on the divide between the church-growth movement and the Emergent movement that Webber describes. It's the difference between method and content. For a church-growth pastor, the Emergent movement may very well reflect just another strategy to bring people to Christ that can be packaged and sold, just as new forms of music are packaged and sold to churches to attract contemporary worshippers. For McLaren, an antiwar activist, emerging churches represent exactly what the title of his book says—A New Kind of Christian. "A change in method is not a change in substance," says Webber. "Dan [Kimball, Vintage Faith's lead pastor and author of The Emerging Church] once said to me, 'What is the danger of what I'm doing?' I said, 'Dan, the real problem here is if what you're doing in going back to the ancient church is just a new gimmick, you're not going to last. You have got to have a substance that stands behind the shift into an ancient church model.' I would say Dan Kimball is processing out of a megachurch tradition and represents the emerging church. However, he has not processed as far as what the emerging church will become; therefore, he still has a foot, or maybe even a toe, left in the contemporary megachurch tradition. And there's a consumerist aspect to evangelical Christianity in general." Indeed, Kimball's Vintage Faith Church was born in Santa Cruz Bible Church, a massive church with a sprawling (by Santa Cruz standards) campus that is based on a conservative, church-growth model. Kimball was a youth minister and, in an experiment designed to attract more young people to church, created Vintage Faith. Santa Cruz Bible has two claims to fame: one was its previous pastor, Chip Ingram, a charismatic preacher popular on the circuit tour who has since left for Atlanta; the other was a national-headline grabbing incident in 2004 involving a lesbian couple who had gotten married in San Francisco. Two days after their marriage, they entered a newlywed contest in Santa Cruz Bible in which couples married for less than three years were asked to stand. The lesbian couple ended up winning the contest because their marriage was the most recent, but the pastor rebuked the couple in front of the congregation for their gay marriage. Just last month, Vintage Faith moved from Santa Cruz Bible to First Presbyterian Church, a beautiful, red-brick building near downtown Santa Cruz on Mission Street. Lee Purkey, the pastor at First Presbyterian, found himself with a dwindling congregation, which, once 900 strong, had fallen to about 175 faithful. The empty pews were so disconcerting that Purkey once stood up at an elders meeting and asked his church's leaders to give him a good reason why he shouldn't send his own children to Santa Cruz Bible. But Purkey had a vision. He believed that with the right approach, his church, with its proximity to downtown and the UC-Santa Cruz campus, could reach Santa Cruz's unbelievers. When Kimball came calling, looking for a space to plant Vintage Space, Purkey laid his ideas about a partnership out before the Vintage elders. "They just sat there, with their jaws on the table," he recalls. "And I said, 'Are you the people that God has called to come over here?'" Eight months later, it appeared they were, and now First Presbyterian has a traditional Presbyterian service at 9am, a combined Vintage Faith and Presbyterian service at 11am, and a Vintage Faith Service at 7pm, with the goal of the two churches becoming one in the future. Purkey, conservative theologically, finds himself on the opposite side of the method and content divide that Webber stands on—and sees Kimball as being closer to him in perspective. "With some emergent churches, there is a change in the method," says Purkey, who does not agree with everything McLaren writes in his books. "There are churches that I have some big cautionary flags about. That's not Dan. Dan has been pretty consistent in terms of message. The vehicle has changed, but the message is timeless." Kimball himself is 45 and was born and raised in New Jersey. He has a distinctive blond pompadour and is a fan of rockabilly music. He, in fact, played in a rockabilly band at Colorado State University and traveled with his band mates to England, where he lived for a year and met an 83-year-old Oxford graduate and former pastor who became a sort of spiritual mentor. "I don't trust people's emotions and feelings," he says. "I respected him. For me, even though I know you can't prove [faith], the intellectual reasons for believing are important. This guy was really smart and was able to answer questions and dialogue on a level that I appreciated." He then went off to Israel and the Occupied Territories for four months, where he studied the Bible on his own and experienced for himself the sacred geography of the Bible. After the Middle East, it was on to Santa Cruz, where he found Santa Cruz Bible in the phone book. "I'm still personally conservative," says Kimball. "But conservative is relative. I've been saying that I'm a fundamentalist without being seen as a fundamentalist. I had a girl once tell me—she asked me some questions, and I told her I had no idea how to answer them—and she told me, 'Because you're telling me that, it makes me trust you even more.' I didn't even think about that when I was talking to her. Christian leaders thought they had a lot more answers than they really did. The emerging church is recognizing that we don't have all the answers. We don't say it's a weakness to say I don't know. At the same time, I also need to have an answer if people ask me if I believe Jesus was raised supernaturally from the grave. I better not say I don't know to that one." Kimball experienced what he describes in his book as an "odd" experience one afternoon after he agreed to join an interfaith panel at UC-Santa Cruz. When he arrived for the panel discussion, he found himself seated next a Hindu, a Muslim, a Buddhist and a Wiccan, a practitioner of witchcraft. As students began chiming in with their questions, Kimball had an unsettling realization. "We live in a culture so religiously diverse," he later wrote, "that an evangelical Christian can sit beside a witch on a Q&A panel, both considered representatives of equally viable religious alternatives, and it can feel like 'business as usual.'" It's this realization, perhaps, that is nudging Kimball and other emerging Christian leaders to dull some of the sharper edges of classical evangelicalism. It's doubtful that many of the young worshippers who attend Kimball's church could carry on a conversation about postmodernism, but they love the fact that Kimball carries himself more like a musician than a preacher. "He has really cool hair," gushes one recent convert. Glorious Noise: Josh Fox rocks for the Lord at Vintage Faith. As a church-growth critique, Kimball's core assertion is striking. More and more young Americans, what he calls the postmodern generation, have no experience with church, he points out. Whereas megachurches employed the "seeker-sensitive" model—a strategy designed to attract Christians disillusioned with church by removing the impediments of church (liturgy, overt displays of religious symbolism, traditional rituals, long-running worship sessions)—to grow their congregations at exponential rates, Kimball contends that the model, written about so frequently in recent years as a way to understand the emerging political influence of the religious right, is rapidly becoming irrelevant, even while being perfected more and more by megachurches everyday. In A New Kind of Christian, McLaren presents an effective metaphor for this paradox by pointing out that, in 1910, that despite the recent invention of the automobile, a person would be more likely to purchase a horse-drawn carriage to satisfy the need for transportation because, at the time, horse-drawn carriages were at their peak. "Of course," he writes, "they would be scrapped in the years to come." Similarly, Kimball and others contend, the seeker-sensitive model may be at its peak, but the coming postmodern era could very well cause the model to be thrown into the scrap heap of church history. Seeker-sensitive models are designed for "modern" individuals, who were disappointed in the church they were raised in; today, Kimball goes on to say, church leaders have to minister to "postmodern" individuals with no experience whatsoever with church, individuals who live in an environment where the message of a Wiccan witch is given equal footing with the message of a Christian pastor—Santa Cruz, where Wiccan bookstores can be found just as easily as Christian bookstores and, in many ways, the hub of America's alternative spirituality scene, is only the canary in the coal mine, not the exception. "Late one night, I happened upon the band the Cranberries playing an Unplugged concert on MTV. It was an all-acoustic performance. The state was draped with a dark, rich fabric and lit by candelabras. It looked more like a grandmother's attic than a rock-concert venue, and I was struck by the simplicity of it. No fancy light shows or drumset risers. I also noticed how close the audience was seated to the musicians. There wasn't a giant separation between the two groups. Rather, they were all sort of together in a 'community.' I immediately felt that there was something very interesting to this 'unplugged' approach." 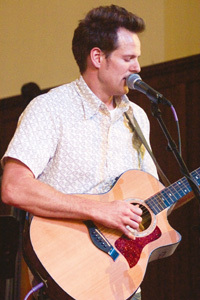 Soon after, Kimball transformed a Wednesday night youth service he had been leading by using the seeker-sensitive model at Santa Cruz Bible into an "unplugged" service. Gone were the high-tech videos, the electric band, the bright lights; introduced were candles, funky furniture, acoustic music and a simple intimacy. Kimball likes to use charts to describe his philosophy. In one, he describes the modern era as marked with monotheism, rationalism, individualism and religion. Then, at the turn of the millennium, comes the post-Christian era, which is pluralistic as opposed to monotheistic, experiential as opposed to rational, mystical as opposed to religious, and communal or tribal as opposed to individualistic. "The later people are born," he writes, "the more they will know only a postmodern world." And so, to survive, evangelical Christianity must adapt to reach to the postmodern unbeliever. The question, of course, is whether the adaptation will be a new marketing gimmick that evangelicals will use to convert the unconverted, an extension, perhaps, of the seeker-sensitive philosophy, or whether the adaptation will be something more genuine and authentic, rooted in the substance of the Christian tradition. In A Call to an Ancient Evangelical Future, a document which will appear publicly for the first time this September in Christianity Today, Emergent thinkers call for what would amount to a theological—not just methodological—revolution in American evangelicalism. The Call argues that evangelicals have reduced theology to "mere propositions," which is made compatible to culture and emptied of meaning; instead, evangelical theology needs to treat the Bible as the world's story, or a master narrative. The shift from the modern to the postmodern—from propositions to narratives—is evident here, and not just in the way a concert at the HP Pavilion is different from an MTV Unplugged concert. Back at Vintage Faith, the church's Sacred Space team had lined the sanctuary's walls with hundreds of 3-by-5 index cards. Earlier, they had asked their congregants to each complete a sentence, the beginning of which they provided and which read, "I want a church that ..." Many of the answers on the index cards were predictable. Vintage Faith's faithful wanted a church that was tolerant, that was accepting, that cared about the downtrodden; many participants filled their entire index card to describe their ideal church. One index card, though, stuck out. "I want a church that is authentic," it read.